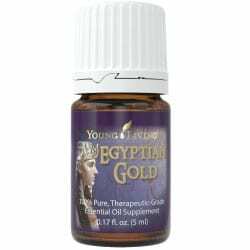 Egyptian Gold Essential Oil Blend was blended with oils used in Ancient Egypt including the biblical essential oils rose, cinnamon, balsam fir, and lavender, renowned for spiritual sensitivities. This transcendent blend gently enhances moments of devotion and reverence. This blend includes the biblical essential oils rose, cinnamon, balsam fir, and lavender, renowned for spiritual sensitivities. This transcendent blend gently enhances moments of devotion and reverence. Considered a holy anointing oil in the Middle East and has been used in religious ceremonies for thousands of years. It elevates the mind and helps overcome stress and despair. This oils is high in sesquiterpenes. Therefore, it may stimulate the limbic region of the brain, the center of emotions. Known as the universal oil because of its wide range of usage. Similarly, it amplifies the frequencies of any oil it is mixed with. Has a refreshing and uplifting scent. Used in massage. For instance, it has a soothing effect on muscle and body discomfort associated with exercise. Idaho Balsam Fir has an approximate ORAC of 205,047 (TE/L). TE/L is expressed as micromole Trolox equivalent per liter. This oil is referenced throughout the Old and New Testaments. It has one of the highest levels of sesquiterpenes, which is a class of compounds having direct effects on the hypothalamus and the pituitary glands. Therefore, it is responsible for activating hormone and immune response. Highly regarded in India as a perfume, health-supporting herb, and skin tonic. Prized at the time of Christ. Above all, it was used by Mary of Bethany to anoint the feet of Jesus before the Last Supper. This is a relaxing and soothing oil. A biblical oil that was also sacred to ancient Greeks, has a fresh, woody scent that is slightly sweet. Hyssop is noted for its purifying properties. Hyssop has an approximate ORAC of 209,167 (TE/L). TE/L is expressed as micromole Trolox equivalent per liter. High in sesquiterpenes which can stimulate the limbic part of the brain (the center of our emotions). This conifer oil has been used by North American Indians to enhance spiritual awareness and communication. Aboce all, it also may help stimulate the pineal gland, which releases melatonin. Possesses the highest frequency of the oils. In addition, it creates a sense of balance, harmony, and well-being and elevates the mind. Has that wonderful spicy scent loved around the world. Historically, cinnamon was so popular it was the main reason behind the occupation of Ceylon by first the Portuguese, then the Dutch, and then the British.